Begin reading to children as soon as possible. Use Mother Goose rhymes and songs to stimulate language and listening. Read and re-read books that are predictable and contain repetition. Have a set time each day that is set aside for reading. To encourage involvement, have your child turn the pages for you. Keep children involved as you read by occasionally asking "what do you think is going to happen next?" Regulate the amount of time spent watching television. Lead by example. Let your children see you reading. Incorporate 6 simple and powerful Early Literacy Practices into your everyday activities to help your child learn early literacy skills. Counting is a great way to teach your child to reason logically, solve problems and make connections between mathematics and everyday life. Play is one of the primary ways young children learn about how the world works and learn language. Play helps children understand that written words stand for real objects and experiences. Reading together remains the single most effective way to help children become proficient readers. A child's interest in reading is an important predictor of later reading achievement. Singing develops listening skills and helps children pay attention to rhythm and rhyme. Singing helps children learn new words, adds to their general knowledge and is just plain fun! Talking, telling stories and stretching conversations are ways children learn new information, new vocabulary and other early literacy skills. Writing and reading go together! Both are ways to represent spoken words and to communicate information. Occasionally read above children's intellectual level this is a great way to challenge their minds and expose them to new experiences. Read like you mean it! Change your pitch and volume to show different characters or create a mood. Before you begin to read, always say the name of the book and introduce the author and illustrator, no matter how many times you have read the book. Reluctant readers often find it hard to sit still so try giving them a pencil and paper during the read-aloud experience to keep hands busy. Don't read stories you don't like yourself. Your dislike will show. Don't be fooled by awards. An award-winning book may not necessarily be a good read-aloud. Don't use the book as a threat - " If you don't clean your room, no story tonight!'' This will foster a negative attitude about reading, not a positive one. 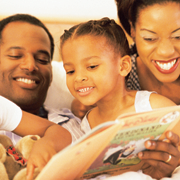 Don't stop reading aloud once your child starts reading by himself. Reading and listening skills don't begin to converge until about 8th grade. Don't get too comfortable while reading. A reclining or slouching position is most apt to bring on drowsiness. A reclining position sends an immediate message to the heart: slow down. With less blood being pumped, less oxygen reaches the brain--thus drowsiness. Don't be unnerved by questions during the reading, particularly from very young children in your own family. If the question is obviously not for the purpose of distracting or postponing bedtime, answer the question patiently. There is no time limit for reading a book but there is a time limit on a child's inquisitiveness. Foster that curiosity with patient answers--then resume your reading.